PennDOT's largest project this year in southcentral Pennsylvania is going to make a huge difference for travelers of Route 283 in Dauphin County, but it's just a portion of the $533 million in total construction the eight-county region will see. PennDOT Secretary Leslie S. Richards, along with Governor Tom Wolf and Pennsylvania Turnpike CEO Mark Compton, kicked off the 283 project during a press event May 5. "A safe, efficient transportation system is a necessity to have thriving commerce and travel in Pennsylvania," Governor Wolf said. "From improving rural roads to reconstructing heavily traveled highways, we're investing heavily in communities' quality of life." From left, District 8 Executive Mike Keiser, PennDOT Secretary Leslie S. Richards, Governor Tom Wolf, Pennsylvania Turnpike CEO Mark Compton and state Rep. Tom Mehaffie kick off the Route 283 project outside the Pennsylvania Turnpike headquarters in Dauphin County. 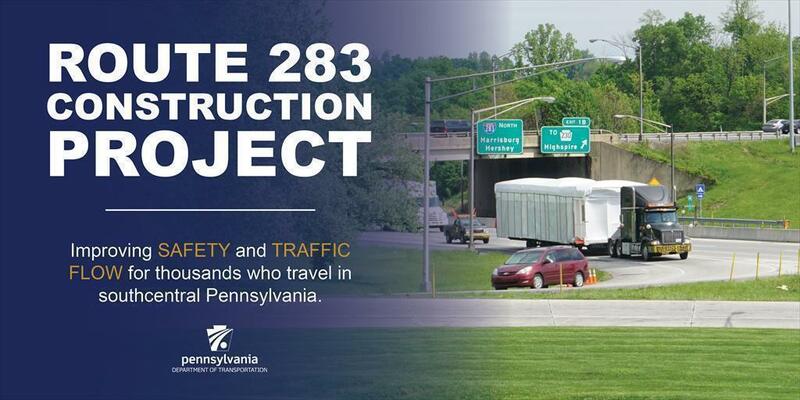 The Route 283 project includes the total reconstruction of the existing highway between Eisenhower Boulevard in Lower Swatara Township and Route 341 in Londonderry Township. In addition to the highway reconstruction, the project also includes the rehabilitation of 11 bridges — eight mainline bridges on Route 283 and three overhead bridges. The emphasis in 2017 will be preparation work on Route 283 and the rehabilitation of the three overhead bridges — the Newberry Road, Union Street and Vine Street bridges over Route 283. Night work is scheduled to begin in June with milling and paving the shoulders along Route 283 in preparation for next year. In mid-June, the contractor will begin paving crossovers in the median, also in preparation for next year. Rehabilitation work on the Newberry Road bridge over Route 283 is scheduled to start in mid-June and rehabilitation of the Union Street and Vine Street bridge should begin in early July. Also, as part of the project, in 2019 a new traffic pattern will be established in the interchange between Route 283 and Interstate 283, in front of the Pennsylvania Turnpike. A new traffic signal will be installed at the west end of the bridge that carries Route 283 over the I-283 connection with the Pennsylvania Turnpike and a new ramp will be built from the location of the traffic signal to the entrance of the Pennsylvania Turnpike. After the new traffic signal and new ramp are completed, the existing loop ramp in the interchange from westbound Route 283 to southbound I-283 will be removed. This will help improve safety by eliminating the current crisscrossing of traffic between motorists on southbound I-283 headed to eastbound Route 283 toward Lancaster and those motorists entering southbound I-283 toward the turnpike from the ramp from westbound Route 283. The overall project will finish in late 2020.
the $58.3-million realignment and reconstruction of I-83 at the Exit 18 interchange with Mount Rose Avenue in York County. Visit the District 8 website to view 2017 construction season maps for each of its eight counties. Or visit PennDOT's projects website to see all active construction projects, or projects planned in our four- and Twelve Year Plans or those made possible by Act 89. "There are a lot of construction zones right now, and that's a good thing," Richards said. "That means that we are making our transpiration network better and we are making the improvements that are needed." And with the abundance of work zones — in southcentral Pennsylvania and around the state — PennDOT urges motorists to be patient and slow down. In 2016, there were 2,075 work zone crashes in Pennsylvania. Just a moment of distraction can lead to very serious consequences and even to the loss of someone's life. For more work zone safety tips, visit www.penndot.gov/safety. Check travel conditions around any of PennDOT's construction areas — or all of our 40,000 roadway miles statewide — by visiting 511PA.com.